"It's a Boy" is one of the most exciting statements a set of new parents ever gets to say, it is truly like nothing else. Visions of baby blue tiny knit booties and handsome mini bow ties, coupled with dreams of sporting events galore will run through a new parent's mind. Imagining all of the soccer games, football practices, track and field events and endless choir concerts, the story of your child's life is truly an adventure as you watch it unfold. Anticipating your little boys arrival, one of the first things you want to do is to look for some cute birth announcements. Our staff of designers knows cute better than anyone else in the marketplace, so when the time comes that you need to order your baby boy birth announcements, check out our on-line boutique for endless inspiration. We have everything from dapper bowties to little spiffy tuxedos or maybe you have a colorful circus animal theme in your nursery and you want to coordinate your shower with your love for animals, we got you covered! Whatever you can dream up, we are here for you. 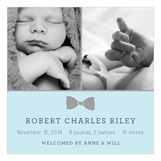 The next thing you want to handle is to collaborate with your closest and dearest friends, as they won't want to host a baby shower for you that doesn't reflect your aesthetic, So, get everyone together one afternoon and pick out a few baby shower invitations for boys from our online store. You can choose from a Rock N Roll theme or maybe you want to keep things more traditional with a monogram shower, inviting your guests to bring all things monogram for your handsome little fella. We can help you sort it all out, just give us the details and we will walk you trough the rest! Remember that when it comes to printing invitations we are one of the highest quality invitation printing services in the marketplace. We have been doing printed invitations since 1999, can you believe it! We really know our stuff. Keeping high quality and expertise mind when you create your shower invitations is key. Don't let your baby boy stationery be handled by anyone other than us. We guarantee you'll love them. Whenever your baby boy arrives into your arms that sweet, memorable day all you have to do is send us back the details of the baby's weight height and any other information about him. We will then send you one more proof for you to take a look at it and will send it to print promptly arriving, ready for you to your house just about the time you're bringing your baby home. Imagine playing with your newborn in your lap and addressing all of your envelopes, preparing to let everyone know that your son has finally arrived and let them into how cute your little one is. Let us celebrate life with you by helping you pick out the perfect baby announcement. Truly, it's our pleasure.